The next play in Austin Scottish Rite Theatre‘s Family lineup combines an American classic with a South Asian flair. 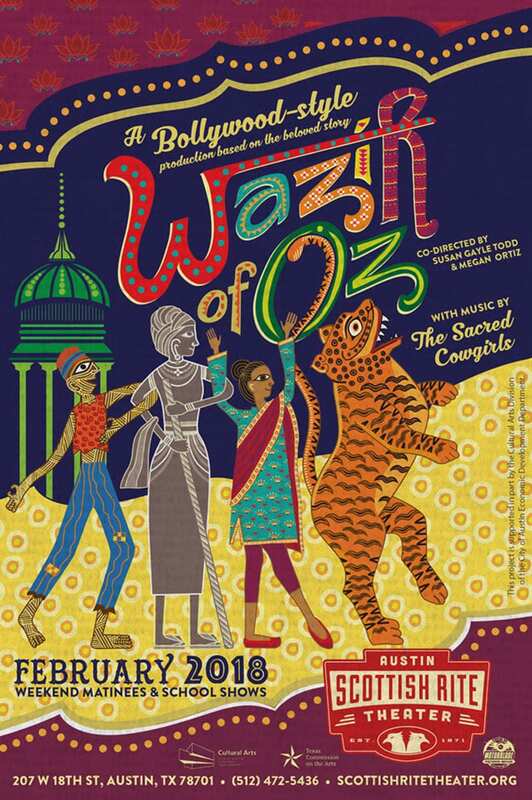 The Wazir of Oz is a Bollywood-inspired tale full of live music and dance, and shares the story of a young girl named Drithi who follows the marigold path to Oz. This children’s play opens on Saturday, Feb. 3 and runs through Feb. 25. About the Show: When the Wazir of Oz gets word that the girl with red sandals is headed to Oz, he and his sidekick do all they can to stop her. Join Drithi and her fellow travelers as they learn the benefit of seeing things from a new perspective. Live music by Austin’s Sacred Cowgirls and an original script and choreography featuring traditions and culture from South Asia. This play is approximately 45 minutes long. Tickets and Showtimes: You can take the kids to see this production on Saturdays and Sundays at 11 a.m. and 1 p.m. Click here to view the full schedule. Tickets are $8 for children and $12 for adults. You can get your tickets in advance online here or at the box office before each production. As with all children’s plays at Austin Scottish Rite Theatre, kids are invited to come early for coloring time in the grand lobby as well as to snack on cookies or drinks (priced at $1 each). Once the theatre doors open, kids are invited to sit on the carpets near the stage to get up-close to all of the action and enjoy the best seats in the house. And kids can stick around after the show for photos and autographs with the cast. Giveaway: We have a 4-pack of tickets to give away to the show on opening day, Feb. 3 at 11 a.m.! Enter below. Good luck! Entering the giveaway will add you to the Do512 Family email list, where we let you know about the best family events in Austin each week. This giveaway is now closed. Congrats to Katie M. for winning tickets!